This coming Monday, October 22, 2018 is election day for the Mayor and City Councillors in Hamilton. Your vote for #yesLRT is absolutely vital. Despite the many challenges facing the city, anti-LRT obstructionists have manged to turn this election into yet another referendum on the city's light rail transit project, which is already being implemented after dozens of Council votes and Provincial approval and full funding. The anti-LRT gang recognize that their window to kill the project is fast closing. They are desperate to keep LRT from happening and will say and do almost anything to stop it. A single-issue anti-LRT mayoral candidate with no real platform has spent tons of money on attack ads in radio, print and online, and even paid for an airplane banner. After the Hamilton Spectator published an opinion article critical of his platform, he even tried to force them to take it down. 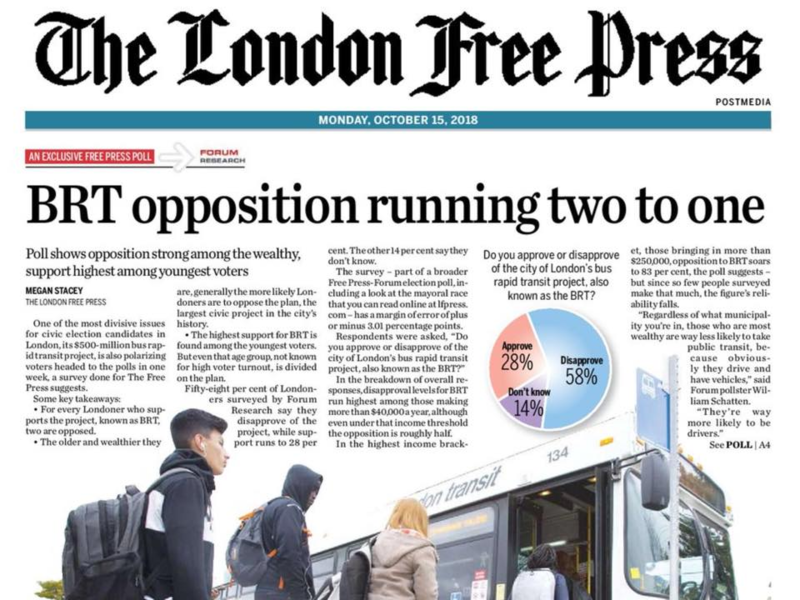 Recent polling suggests the mayoral election is going to be very close between Fred Eisenberger, who supports the LRT plan, and Vito Sgro, who opposes it. That means every single vote counts, especially since voter turnout in municipal elections is usually low. Find out what the candidates stand for and cast your vote for LRT in Hamilton. If you are not sure where to vote, the City has a web page where you can look up your polling location. If you are a Canadian citizen 18 years old and live or own property in Hamilton, you are eligible to vote. The Province has promised that if Council continues to support the LRT plan, they will honour the funding commitment. The alternative is a vague pledge that we will get some amount of money for some kind of alternative project at some point in the future. We can't afford to trade the certainty of a well-designed transformational plan with broad support for a cheap slogan. As Chamber of Commerce CEO Keanin Loomis recently put it, "LRT is infrastructure. In fact, it's the best kind of infrastructure — it delivers a long-term return on investment." Vote. Urge your family and friends to vote. Don't let the city's future be decided by people with no vision who are terrified of change. If they win, we will all pay the price for decades to come. 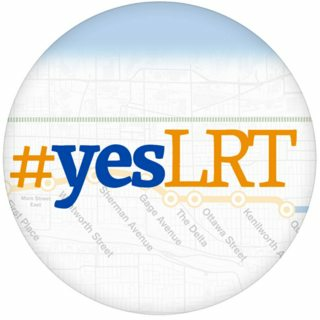 I am #yesLRT long term. My old hometown Ottawa's LRT was resurrected 4 years after cancellation. Ottawa cancelled and resurrected their LRT. Call me a dreamer if you wish but I am Ottawa-born. 2018 is not the final chapter for LRT. 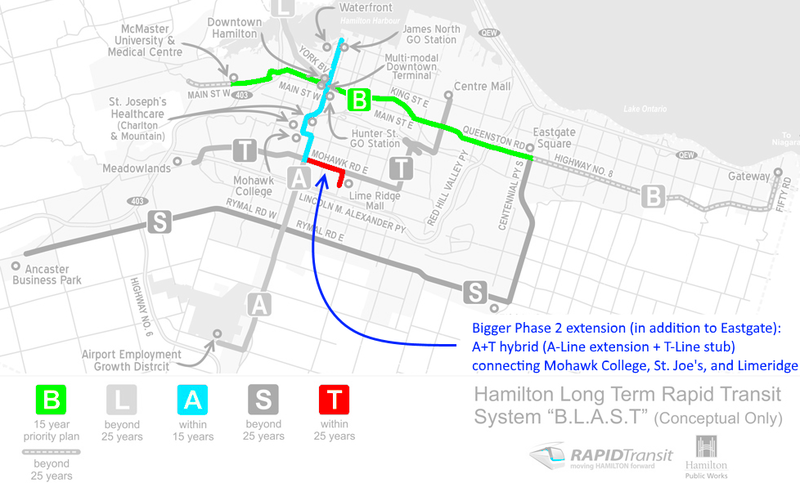 Once B-Line LRT safely begins construction, Hamilton LRT Advocacy sill will advocate for bus expansions AND turning A-Line LRT into a 2-phase LRT expansion. A-Line Phase 2 to Airport. A-Line LRT can be won in 2022 election for a 2025 construction begin of Phase 1 just like Ottawa Phase 2 LRT (approved unamiously by city council) begins construction next year www.stage2lrt.ca. A-Line LRT Phase 1 to Limeridge The business case for A-Line to Limeridge will be justified by 2030 benefits (Waterfront revitalization + 2 GO stations + StJoe Hospital + Mohawk College + Limeridge Mall + Infill Developments) so we can justify 2025 construction begin for A-Line LRT Phase 1 for construction completion by approximately 2030. Transit ridership (by 2030) and density on A-Line Phase 1 is much greater than certain sections of Ottawa's LRT and KW LRT. This is how we can justify A-Line LRT quicker and sooner, by doing a minor optimization to the BLAST network. The rest of the network can be BRT/express buses while we are continuing to build LRT. A-Line LRT Phase 2 to Airport Once A-Line LRT Phase 1 is built, we can focus on an LRT all the way to the airport, especially with infill developments along the way, and increase in airport-area popularity. We already have upcoming money for a bus expansion. 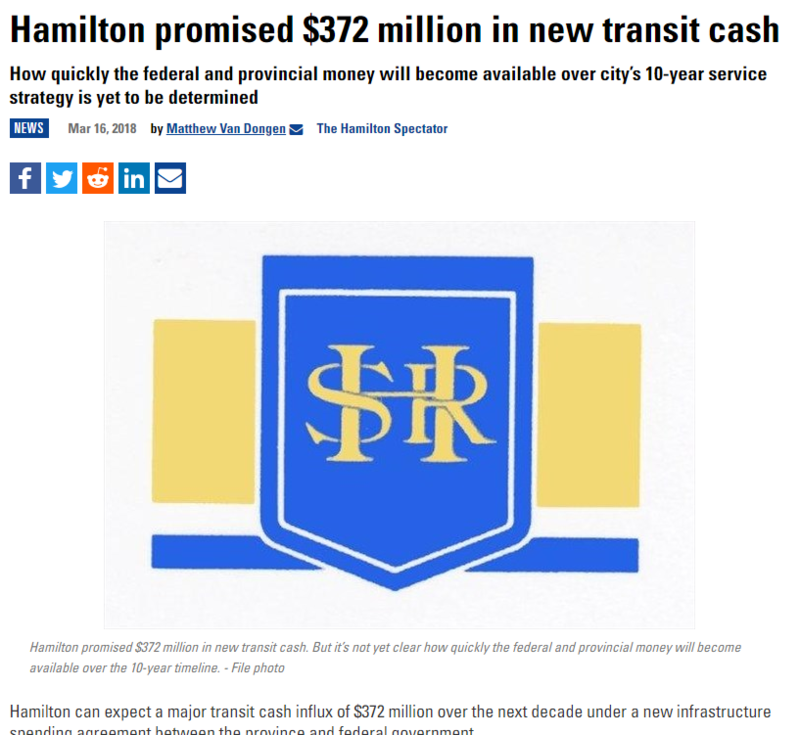 This is federal funding too, separate of existing LRT money. So we are getting bus expansion in addition to LRT if we stay the course on LRT. And in Ottawa, even suburban & rural bus stops had bus signs as big as road signs with clear route numbers. 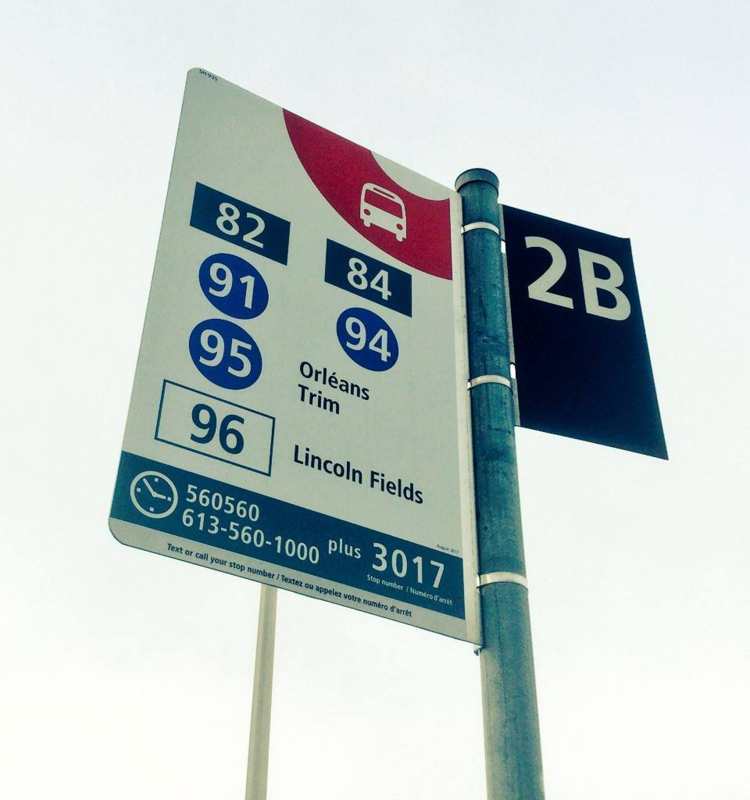 WHY should bus stop SIGNS be more second-class than road signs? Ottawa does it properly for accessibility. Ottawa made them ALL guaranteed minimum size since the 80s. All stop signs. Citywide. Even suburb/rural. Hamilton deserves this. I plan to strongly lobby for this for HSR once B-Line LRT begins construction. I'm not anti-bus. I can be a BUS SNOB too, even though I am #yesLRT. I was born in Ottawa, lived and breathed Transitway BRT, and it was a real, true BRT. Ottawa has first class BRT treatment. Ottawa has had the world's first BRT (1973) and then world's largest BRT (1983) for many years. The fancy modern fire-engine-red transitway stations with computerized next-bus arrival terminals in 1983. 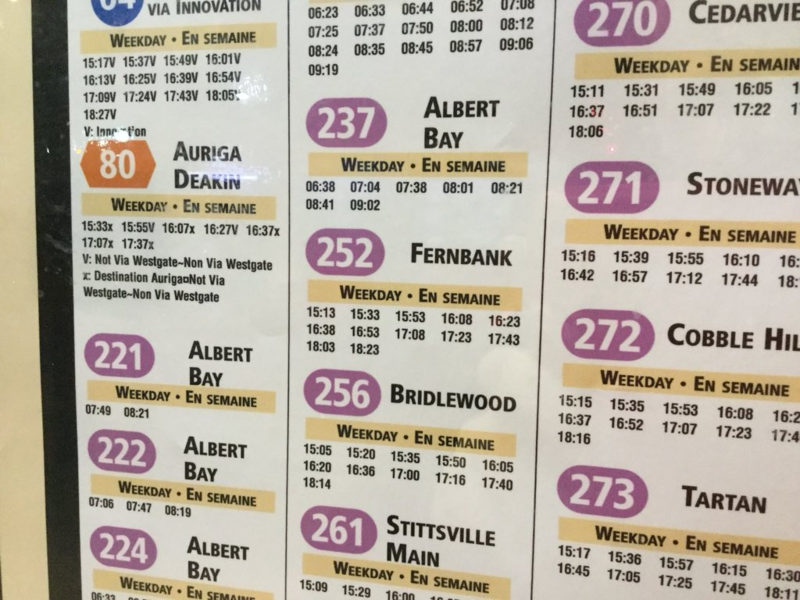 Public transit was treated like a first class citizen by Ottawa, with loving attention to route numbers. ...That fast bus trip felt like a freeway for buses. Often, the buses whooshed 70kph down the straightaways between Transitway bus stops. I often got frequently whisked between downtown and St. Laurent Mall in roughly only 15 minutes, on time to watch the movie showtimes, whether it was Gremlins or Short Circuit or such. The small section of bus-congested downtown bus lane was a bone of contention at peak (surface crossings much like the downtown section of Calgary C-Train) but never really truly became truly intolerable until recent decades. ...That easy signage. Even back in 1983, route number signage was extremely easy to read, -- you could read route numbers from almost one bus stop down the street (making it much easier to decide which direction to walk if you walk to a street and find yourself between two suburban bus stops). ...Easy visual accessibility. I can't as easily identify bus routes on Toronto bus stops (nor Hamilton) from across the street, while it was always easy from a distance in Ottawa! ... Even that unsheltered rural bus stop pole had Canada's biggest bus stop signage. ...Sterling five-star route number signage department. Say and complain about OC Transpo, but big kudos credit where due to the hawkish bus stop signage department at OC Transpo that has, ceaselessly nitpicked the entire OC Transpo network to minimum route-number accuracy, readability, and clarity standards far beyond almost any North American city, par excellencé, bar none, full stop. Rural bus stop to suburb bus stop to trantitway bus stops, the bus stop signage was always consistent and clear on a guaranteed minimum quarter-square-meter-size sheet metal (guaranteed minimum surface area) that never got lost in background clutter of telephone poles, road signs, etc. ...Never felt lost in the pre-cellphone days I never felt lost in Ottawa as a transit rider - I could confidenty at 10 years old (as a deafie unable to make phone calls until I was age 15) - take a bus anywhere in Ottawa, knowing I'd easily get home with the first-class treatment of route signage everywhere including bus network posters in nearly all bus shelters -- even far away from the BRT. Maps were attached to rural bus poles, for chrissakes!!! ...Hamilton deserves first-class treatment of buses too That's why when B-Line LRT begins construction in Hamilton, I intend to strongly advocate for "details" like these for Hamilton so that Hamilton's bus system is not second-class (details like wimpy tiny signs that are hard to see). A great spine system (BLAST system that includes both LRT and BRT) will help enhance the rest of the bus system. So we must stay the course, #yesLRT to get a greater bus system here. 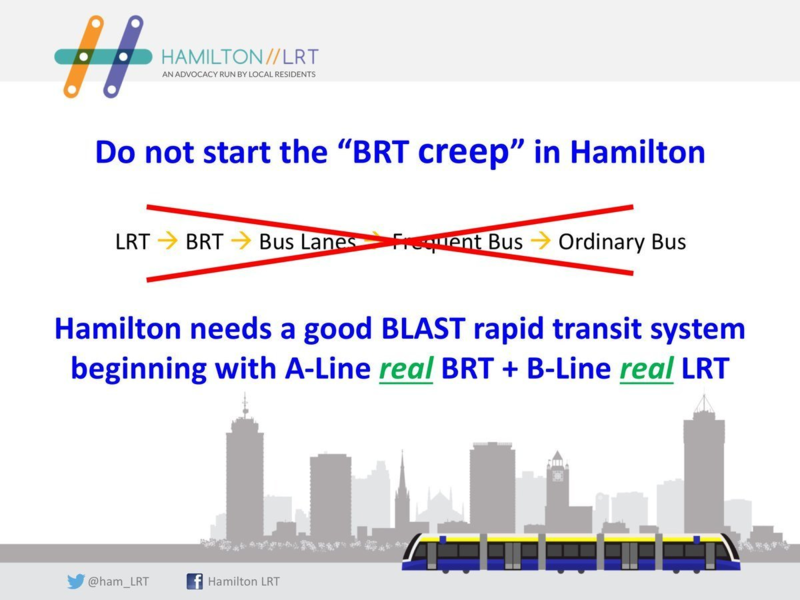 ...BRT-only is not the right choice for BLAST. We need both LRT and buses in BLAST. The problem is Ottawa built their BRT through mostly undeveloped corridors and infrastructure. Hamilton has to unfortunately ram our high-order transit through already-developed infrastructure, with equally bad temporary construction disruption. We have to survive short-term pain for long-term gain. But it is less disruptive than ramming RHVP/LINC through the city -- and less expropriation -- yet fewer complained about RHVP/LINC than with LRT? This is a strange way of looking at things. 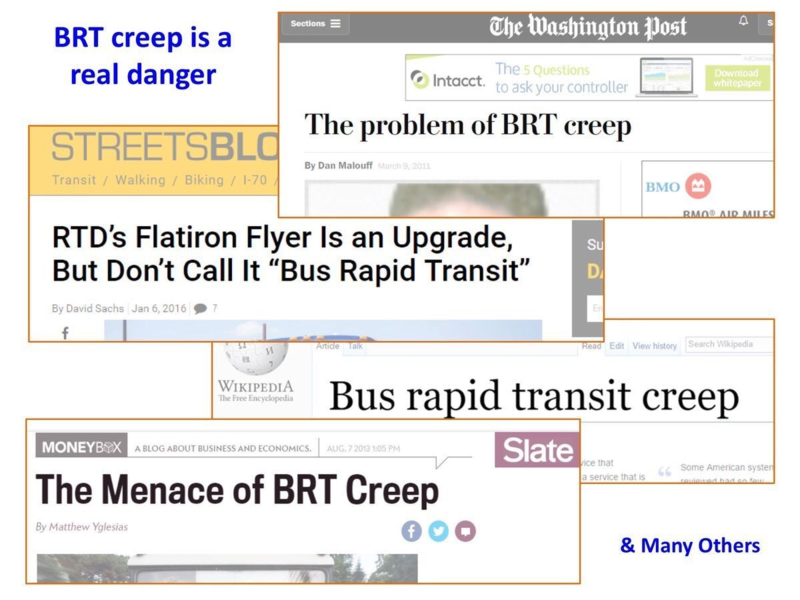 Cities have suffered a phenomenon called "BRT creep" where buses are watered down. London decided to do BRT instead of LRT because of anti-LRT people. London is now suffering anti-BRT. DO NOT LET THIS HAPPEN TO HAMILTON IF YOU LOVE YOUR BUSES. And this will result in better buses. I promise you, I will work goddamndest hard. You see, I am a bus snob, and I am #yesLRT because I also want a better bus system too. I intend to work hard to resurrect LRT by 2022 if B-Line is cancelled. I intend to work hard to expand LRT A-Line if B-Line begins construction 2019. Ottawa's LRT got cancelled and then resurrected. I am Ottawa born, I lived and breathed buses and BRT. So, I hope you voted #yesLRT today on October 22, 2018. This is fact and reality, because I am Ottawa born, the best bus transit of Canada! Looks like #VitoVetoed and we have a strong #yesLRT mandate for B-Line! We still need to improve buses even while waiting for A-Line LRT. What's particularly interesting about London's rapid transit process (something I mention in part 2 of my Ottawa article, coming soon) is that, the University of Western Ontario's governing council was one of the strongest anti-LRT voices (openly hostile of BRT as well). Where as both the governing bodies of Wilfred Laurier University and the University of Waterloo were falling all over each other, especially during the Transit EA process, to make sure what became the Ion LRT Line had stations connected to their respective school properties. Not just a connection but easily accessible connections to their respective campuses. In Vancouver, the Millennium Skytrain line is being extended in 2 phases. Phase 1 is a 5.7 km tunnel underneath a major east-west street known as Broadway to the Arbutus intersection. This 6 station tunnel is a mind blowing $2.83 Billion and likely to climb well above $3 Billion before construction starts. What's important is that, phase 2 of this project is a 7.8 km extension further west to the UBC campus. The expected cost of phase 2 is around $3.6-$4.5 Billion. Even though the cost is extreme and the ridership really doesn't require a tunnel or maybe because of these conditions, UBC is trying to kick in hundreds of millions in it's own money, to bring phase 2 closer to reality sooner! I wonder what the governing body of Western would think about that! Here in Hamilton, all of the anchor institutions - including McMaster University and Mohawk College - have lined up in support of LRT. McMaster is already planning for LRT, including building a new transportation centre around the LRT station.